Asthma is a chronic inflammatory disease which affects the airways, causing difficulty in breathing with repeated episodes of wheezing, breathlessness, a feeling of chest-tightness, and coughing. These symptoms compromise the ability to have a good night’s sleep, and significantly impact normal daily activities. While a family history can contribute to asthma susceptibility, in most cases the cause of asthma is not known, and there is no known cure for the disease. Asthma episodes can be readily triggered by a variety of allergens, such as house dust mites, pollen and animal dander, in addition to tobacco smoke, cold air, exercise and exposure to cold/flu viruses and car exhaust fumes. 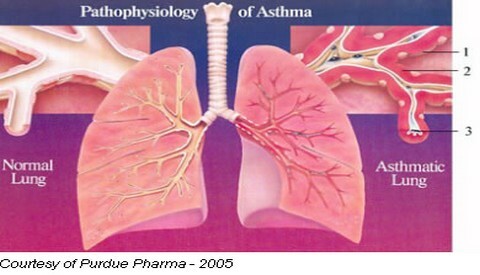 When asthma is under control, the airways are clear, and air flows easily in and out of the lungs. When asthma is not under control, the walls of the airways in the lungs become inflamed and swollen, decreasing airflow. During an asthma attack, muscles around the airways constrict, thereby further reducing the amount of air that can pass in and out of the lungs. An excess of thick mucus forms in the airways, clogging them even more. The muscles surrounding the bronchial tubes contract excessively (bronchospasm), thus narrowing the airways. The lining is red and swollen (inflamed) causing further narrowing. Sticky mucus secretions block the airways. Asthma is one of the most common chronic diseases worldwide and children are particularly susceptible. According to the worldwide Global Initiative for Asthma (GINA), as many as 300 million people worldwide suffer from asthma and this is expected to increase by another 100 million by 2025 (GINA 2004). Asthma prevalence, morbidity and mortality all seem to increase as communities become more urbanized and pollution increases, while family history raises the risk of developing asthma 3-6 fold (Center for Disease Control 2005). Every day in America, 30,000 people have an asthma attack (Asthma and Allergy Foundation of America 2005). Assessment of such attacks are an indicator of how many people have uncontrolled asthma and are at risk of a poor outcome, such as hospitalization. 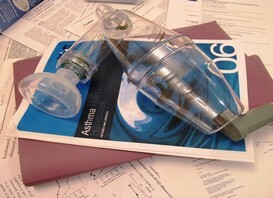 Of patients with asthma, approximately 30% are diagnosed with mild, intermittent asthma; 25% with mild persistent asthma; 28% with moderate persistent asthma and 14% with severe persistent asthma. .
Asthma produces a substantial economic and social burden including healthcare costs, absenteeism from school and work and an inability to participate in recreational activities. In 2001, children 5-17 years of age missed 14.7 million school days due to asthma, while adults 18 years of age and over who were currently employed missed 11.8 million work days. Moreover, based on estimates provided by the National Heart, Lung and Blood Institute the economic burden of asthma totaled about US$14 billion. Asthma remains a life threatening disease which is still considered by leading health authorities to be under-diagnosed and under-treated. 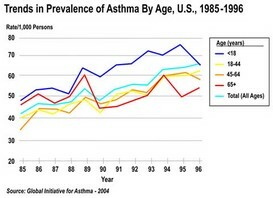 An estimated 5,000 deaths in the US are attributable to asthma each year, a number that is also on the rise. No cure exists for asthma. However, treating asthma involves managing both the chronic inflammation and recurrent episodes of airflow limitation and bronchoconstriction. Asthma control medicines are taken daily over a long period of time to prevent asthma symptoms from developing. Currently, the most effective of those aimed to reduce inflammation of the airways are the corticosteroids, given by inhalation. Another important type of control medicine is long-acting beta2-agonists. This treatment relaxes the smooth muscles of the airways to improve airflow and prevent symptoms, especially at night, but they don't affect the inflammatory component of the disease. Another long-term control medication to treat asthma is leukotriene modifiers. Leukotriene modifiers may be considered as alternative therapy to low doses of inhaled corticosteroids since they suppress airway inflammation, but the position of leukotriene modifiers in therapy has not been fully established. Leukotriene modifiers improve some symptoms and pulmonary function and reduce the need for quick-relief medications. 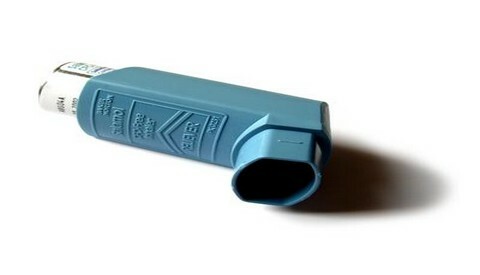 While such drugs produce immediate relief to the patient, they don't provide a long-term benefit, and an increase in use of this reliever medication is often a sign that the patient's asthma is poorly controlled.A asthma sufferer must be cautious in the use of other drugs such as ultram which is used for pain relief. The active compound tramadol hcl is listed in Pubmed as a possible " Pharmacological stimuli in asthma/urticaria."